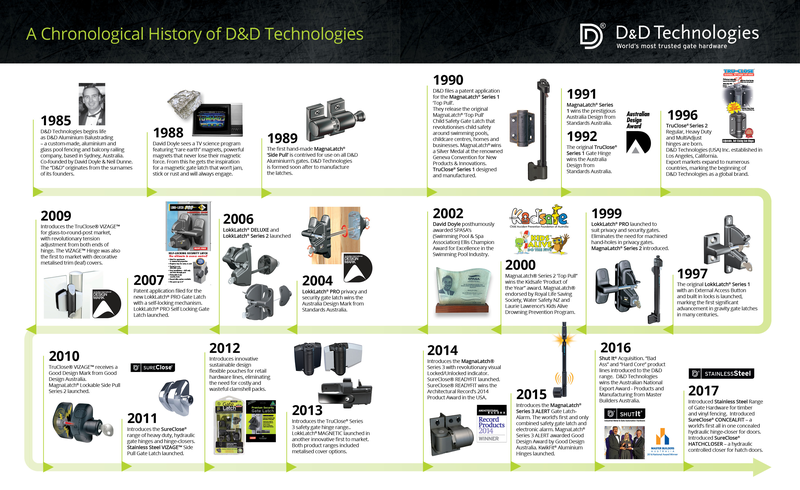 D&D Technologies started out in Sydney, Australia, evolving from a small, family-owned fencing company to become a worldwide market leader in gate hardware. The owners of the then D&D Aluminium Fencing company had been frustrated by the lack of reliable, durable gate latches and hinges to complement their custom-made aluminium-and-glass pool fencing systems. In 1988, one of the company’s founders, David Doyle, saw a science program featuring "rare earth" magnets – highly efficient magnets that never lose their magnetic force. Devising a latching mechanism around this idea, and using rust-free engineering polymers and stainless steel components, the MagnaLatch was born. Soon, other local fencing contractors and fabricators were wanting to use the magnetic latches, and 'D&D Technologies' was established to design and manufacture the products. Following the success of the MagnaLatch® D&D went on to design and manufacture a complete range of polymer-based latches, locks and hinges at its Sydney premises, including the award-winning TruClose® self-closing child safety gate hinges, the general-purpose LokkLatch, the higher-security LokkLatch DELUXE and the LokkLatch MAGNETIC Gate Lock. D&D Technologies (USA) was established in 1996 to begin D&D’s growth as an Australian exporter. D&D Technologies now enjoys a reputation as the #1 gate hardware designer in the world, with established markets in Australia, New Zealand, the USA, Canada, South America, the UK and continental Europe. While we’re in the business of profit, we’re very proud of the fact our products save children’s lives. We give back to the community with our strong financial and practical support of child-drowning-prevention organisations worldwide. It's all part of our passion and commitment. D&D Technologies is a company dedicated to the design and manufacture of quality, state-of the-art gate latches, locks and hinges. We are the trusted name in innovative gate hardware and our Australian-made products are sold worldwide. Established in the late 1980s, D&D gained international recognition with its ground-breaking MagnaLatch® magnetic child safety gate latch for swimming pool and other child safety gates, winning several prestigious design awards for its revolutionary design. Since then D&D has expanded operations and continues to grow its product range, delivering innovative safety, privacy and security gate hardware solutions. And we are fiercely passionate of our Australian Made and Quality Assurance status.